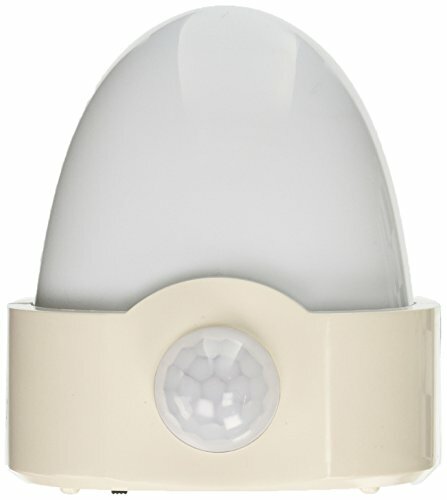 The Dorcy 41-1076 2-AA Battery Operated Indoor Motion Sensing LED Night Light features powerful LEDs for small area lighting anywhere you need it without connecting any wires. This model comes with everything you need to add safe, anywhere lighting in your house garage or crawl space. The 41-1076 motion light illuminates a 180-degree, 350-square foot area with powerful technology. There are three tactical settings including constant-on, motion detecting and off. The sophisticated motion sensor coupled with photo sensor, allow for activation only when it is dark or when motion is detected. The light will automatically turn itself off. Uses (2) AAs (not included). The Dorcy 41-1076 2-AA Battery Operated Indoor Motion Sensing LED Night Light comes with a 1-year limited warranty that protects against defects in materials and workmanship. Dorcy International offers an expansive range of lighting products and continues to evolve with new market demands, ranging from LED technology and fashion to leadership in new product development. Dorcy's complete packaging and distribution center is located right here in the USA in Columbus, Ohio. Dorcy International has been making flashlights for over 55-years and is proud to be business partners with many of the world's largest retailers. Visit www.amazon.com/dorcy for more information on Dorcy and our extensive line of products. If you have any questions about this product by Dorcy International, contact us by completing and submitting the form below. If you are looking for a specif part number, please include it with your message.